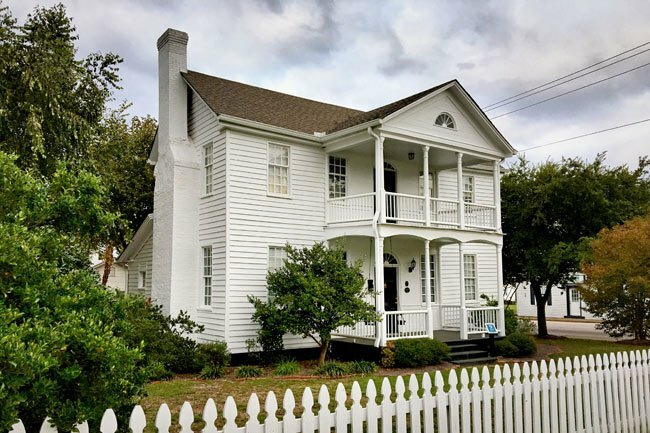 This farm house in Lexington was likely built some time around 1830 for Dr. Thomas Hayne Simmons, who moved to the area from Charleston to practice medicine. In fact, Dr. Simmons was one of the first – if not the first – physician to practice in Lexington County. Dr. Simmons died in 1853, and local lore claims he died form consuming too much ice cream. Following Simmons’ death, the house was bequeathed to his wife, Mary, who became post mistress of Lexington in 1866. The post office operated from Dr. Simmons’ former office. Mary Simmons died in December of 1867, leaving the home and post office to the Simmons daughter, Mary Simmons Harth. Harth served as post mistress until her death 1895, working from her father’s former office. The post office was relocated to the grounds of the Lexington County Museum in 1974. 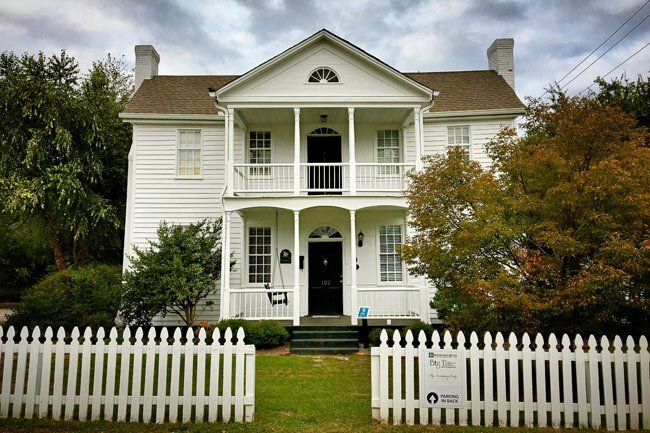 The museum includes several historical buildings from the county, including the John Fox House. The two-story, Federal-style Simmons-Harth House was purchased by James Harman in 1897. Following his death in 1928, the home was passed to Harman’s daughter, who remained in the home for most for the twentieth century. In recent years the home has been used as office and retail space as well as an event site. The Simmons-Harth House, constructed ca. 1830, is a two-story, rectangular, later Federal style frame house with a gable roof, exterior end chimneys, and one-story shed rooms on the rear. The house is sheathed in weatherboard siding, and the roof is covered in standing seam metal. A double-tiered, pedimented portico is attached to the façade. The portico features slender wooden columns and pilasters and a fanlight in the gable end. The area of the façade protected by the portico is sheathed in flushboard and has a chair rail. The portico also shelters a fan-lighted central entrance on each story. Alterations include replacing the first-story columns with square wooden posts ca. 1900 and enclosure of the original central, open passageway between the shed rooms on the rear. The house is one of the town’s oldest residences and one of the few remaining buildings illustrating the early history of the town. The house was probably constructed ca. 1830 by Dr. Thomas Hayne Simmons and his wife Mary Reid Jones. In 1866, Mary J. Simmons was appointed postmistress for Lexington village. In 1868 their daughter Mary Simmons Harth was appointed postmistress and remained in that office until 1895. She operated the post office from a small wooden building on the property, which was moved in 1974 to the Lexington County Museum property.